In October 2012, the LulzBot AO-100 3D printer became the first hardware product to be awarded use of the FSF's RYF certification mark. Since that time, Aleph Objects, Inc. has continued to release new and improved successors to the AO-100 model, including the AO-101, TAZ, TAZ 2, and TAZ 3, each of which have complied with RYF certification mark requirements. 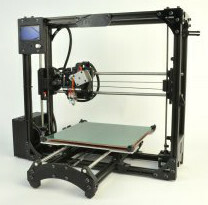 The latest model, which can be purchased from http://www.lulzbot.com/products/lulzbot-taz-3-3d-printer, has both hardware and software improvements, including a controller with a graphical LCD interface that allows users to print from an SD card and to perform printer start up, selection, and configuration changes. "Aleph Objects, Inc. has become a leader in the free software movement, not only in terms of producing hardware products that respect users' freedom, but also in terms of their engagement with and contributions to the free software community each step of the way," said Joshua Gay, FSF licensing & compliance manager. The software reviewed by Gay as part of the certification for the TAZ 3 printer includes the Marlin firmware for the RAMBo electronics board and ATmega chipset; the Python printing host software suite, which includes Pronterface, Pronsole, and Printcore; and a Slic3r, a program used to convert a digital 3D models into printing instructions. "Aleph Objects, Inc. is honored to receive RYF certification for our latest 3D printer, the TAZ 3. No organization has greater credibility when it comes to user freedom than the Free Software Foundation, which for nearly thirty years has been prescient about technology issues that threaten user freedom. Our goal is to continue to practice these principles as we develop new technology," said Jeff Moe, president of Aleph Objects, Inc. In addition to the the LulzBot line of 3D printers, a total of nine products have been awarded use of the RYF certification mark, including: the RAMBo all-in-one 3D printer electronics board used in the LulzBot printers; two USB wireless adapters sold by ThinkPenguin; and the Gluglug X60 laptop. To learn more about the Respects Your Freedom hardware certification program visit https://www.fsf.org/ryf. Built upon the philosophy of freedom, Aleph Objects, Inc. is transforming the 3D printer industry. Based in Loveland, Colo., they are committed to Libre Hardware, which means their hardware and software will not be locked down, become obsolete, or require licensed upgrades over time. Empowering customers is part of their innovative spirit and LulzBot users are encouraged to be part of the ongoing conversation. Join in and learn more online at http://lulzbot.com. Media Contact, LulzBot/Aleph Objects, Inc.